The child continues doing well, and the accounts are regular and favorable. 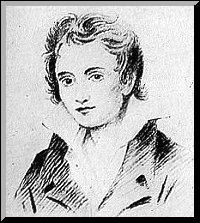 It is gratifying to me that you and Mrs Shelley do not disapprove of the step which I have taken, which is merely temporary. I am very sorry to hear what you say of Keats – is it actually true? I did not think criticism had been so killing. Though I differ from you essentially in your estimate of his performances, I so much abhor all unnecessary pain, that I would rather he had been seated on the highest peak of Parnassus than have perished in such a manner. Poor fellow! though with such inordinate self-love he would probably have not been very happy. I read the review of “Endymion” in the Quarterly. It was severe, – but surely not so severe as many reviews in that and other journals upon others. I recollect the effect on me of the Edinburgh on my first poem; it was rage, and resistance, and redress – but not despondency nor despair. I grant that those are not amiable feelings; but, in this world of bustle and broil, and especially in the career of writing, a man should calculate upon his powers of resistance before he goes into the arena. You know my opinion of that second-hand school of poetry. You also know my high opinion of your own poetry, – because it is of no school. I read Cenci – but, besides that I think the subject essentially undramatic, I am not an admirer of our old dramatists, as models. I deny that the English have hitherto had a drama at all. Your Cenci, however, was a work of power, and poetry. As to my drama, pray revenge yourself upon it, by being as free as I have been with yours. I have not yet got your Prometheus, which I long to see. I have heard nothing of mine, and do not know if it is yet published. I have published a pamphlet on the Pope controversy, which you will not like. Had I known that Keats was dead – or that he was alive and so sensitive – I should have omitted some remarks upon his poetry, to which I was provoked by his attack upon Pope, and my disapprobation of his own style of writing. You want me to undertake a great Poem – I have not the inclination nor the power. As I grow older, the indifference – not to life, for we love it by instinct – but to the stimuli of life, increases. Besides, this late failure of the Italians has latterly disappointed me for many reasons, – some public, some personal. My respects to Mrs S.
P.S. Could not you and I contrive to meet this summer? Could not you take a run here alone?